Why Is New Zealand Sauvignon Blanc So Popular? - City Vino, Inc.
Why Is New Zealand Sauvignon Blanc So Popular? Following the trend of rosés and red blends, Sauvignon Blanc from New Zealand currently represents one of the fastest growing segments of wine. Brancott Estate started producing Sauvignon Blanc in Marlborough, New Zealand, in the late 1970s. They were the first to recognize the potential success that could be achieved by planting Sauvignon Blanc in a climate with long sunny days and cool evenings. Upon seeing Brancott Estate’s success, other wineries soon followed suit, planting more Sauvignon Blanc. In the 1980s, the New Zealand government offered subsidies to growers to rip out vines in order to manage and reduce a large wine surplus that existed in the country. As a result, growers did rip out old vines but replanted them with the newly popular Sauvignon Blanc. In addition, a bout of Phyloxera, which kills vines by eating the roots, hit New Zealand. To overcome the infestation, old dying vines were removed and Sauvignon Blanc vines were planted on Phyloxera resistant roots. Sauvignon Blanc now accounts for over 70% of the wine produced in New Zealand, and more than 80% of the wine that is exported from New Zealand. 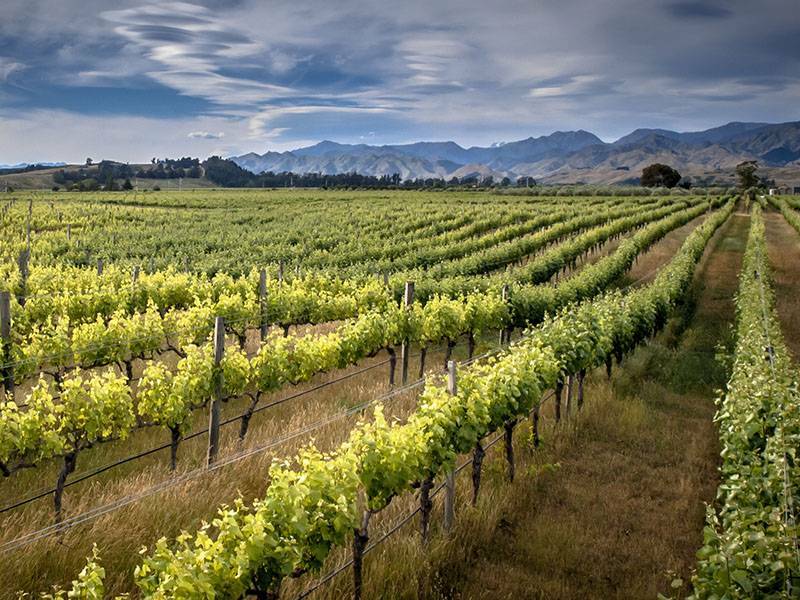 An overwhelming majority of the Sauvignon Blanc coming out of New Zealand is grown in the Marlborough region, located at the northern end of the South Island. The Marlborough style of Sauvignon Blanc is extremely aromatic, with pronounced herbaceous and tropical fruit aromas. They are also known for intense, mouth-watering acidity and flavors of grapefruit and green bell pepper. New Zealand experiences higher levels of UV light, due to its location in the southern hemisphere and low levels of air pollution. It is thought that these higher levels of UV exposure accentuate the vegetal pyrazine flavors in the wine. New Zealand Sauvignon Blancs are bold wines with loads of flavor. That “boldness” is likely part of the reason these wines are so popular in America. The hallmark high level of acidity in these wines makes them refreshing on a hot summer day and also helps them pair well with a wide variety of foods. Given the large volume of wine coming out of New Zealand, it’s easy to find high quality examples at an affordable price--yet another reason for their popularity.